West York Borough is a South Central Pennsylvania municipality that borders the city of York and West Manchester Township. With a population of approximately 4,600 residents, West York offers the benefit of a small-town environment and close proximity to the York metropolitan area. West Market Street, the major artery that runs through the borough and ultimately extends into the city of York, serves as the site of the borough’s business district. It contains restaurants, shops and other small businesses. The borough also borders the York Expo Center, which is the site of one of the nation’s oldest annual fairs, dating back to 1765. West York and West Manchester Township are served by the West York Area School District. The borough is home to one of the district’s four elementary schools, while the middle school and high school are located just over the borough line in West Manchester Township. In 2013, the Pittsburgh Business Times ranked the West York Area School District 253rd out of the 498 public school districts in Pennsylvania with regard to academic achievement. 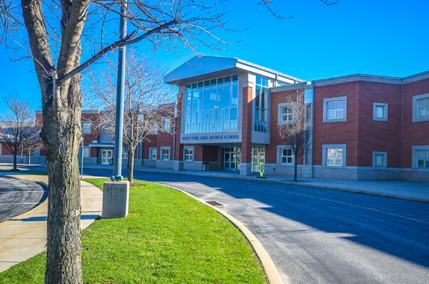 Your search for suitable West York School District real estate can be so much easier and less time-consuming when you enlist the services of CENTURY 21 Core Partners. We understand the West York real estate market better than anyone else in the area. We also list a wide selection of single- and multi-family West York homes for sale — you’re bound to find one that meets your living and price requirements. The widely recognized Century 21® brand, which received the highest numerical score from first-time and repeat home buyers in the J.D. Power 2014 Home Buyer/Seller Study, assures that you’ll experience the highest level of customer service in the real estate industry. Banks: When you move to the West York School District, you’ll often have the opportunity to maintain your existing bank accounts through a large national provider like Wells Fargo, Woodforest National, M&T, BB&T and Santander — branch locations of each are located within the West York School District boundaries. You can also choose to move your banking to a local option such as York Traditions Bank or a regional choice like Fulton Bank, which are also close by. Grocery Stores: You also enjoy several options when looking for grocery stores in the West York School District. Several Weis Markets and GIANT Food Stores are close by, and you may also do your grocery shopping at the large Walmart Supercenter located at West Manchester Town Center. Shopping Centers: The closest large shopping center to West York School District is West Manchester Town Center. There you will find department stores like Kohl’s, a Regal movie theater, many restaurants and a variety of retail stores: Ann Taylor Loft, DSW, GameStop, Kirkland’s, Petco and much more. Just beyond the boundaries of the West York School District you can visit the York Galleria Mall, and many other shopping centers just a short drive away. Restaurants: You’ll find no shortage of dining options in the West York School District, including local options like the Front Porch Café, Famous Restaurant and Isaac’s Restaurant, which is a deli. You can also find familiar staples like Chili’s and Bob Evans, as well as a number of fast food eateries. Beyond the boundaries of the West York School District, other portions of York also offer nearby fine dining options. Parks: The West York School District is full of green spaces for you to enjoy the beautiful Pennsylvania weather. Sunset Lane Park is located adjacent to the West York School District’s own Trimmer Elementary School, and you can also visit Bantz Park along the banks of Codorus Creek. Major Events: What’s known as America’s First Fair takes place right in the heart of the West York School District. The York Fair arrives every September and brings with it food, rides, exhibits and much more. When you live in West York, you don’t have to go far to enjoy this major event. York is also home to June’s Made in America Days, which brings access to the many factories in York — which is known as the Factory Tour Capital of the World. These days, as many as 89 percent of home buyers make the Internet a key component of their search process. The CENTURY 21 Core Partners website is full of features and information designed for today’s tech-savvy real estate purchaser. You can get up-to-date property information in an instant, take virtual tours, view professional-grade property photos, quickly calculate how much home you can afford and more. With our downloadable mobile app, you can also have access to all of these features and benefits even when you’re on the go. Arming yourself with information is important when you’re buying a home. It’s also essential to find a competent agent who always has your best interests at heart. CENTURY 21 Core Partners agents benefit from the best training program in the industry and have an abundance of tools and resources at their disposal. Our goal is to remove the burden of purchasing a West York home for sale from your shoulders. Discover what makes CENTURY 21 Core Partners your best resource when buying a home for sale in West York, PA. Call our office at 717-718-0748, or reach us online by filling out our contact form. And be sure to check out our list of upcoming open houses in the West York area!